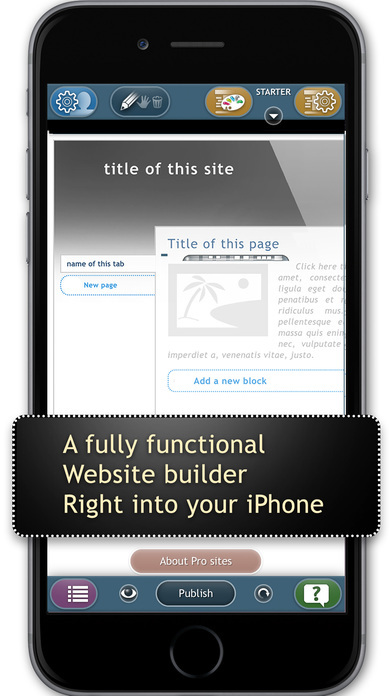 SimDif Website Builder is a popular website creation tool for the iOS, Android and Amazon platforms. SimDif Website Builder allows individuals and businesses alike to easily and efficiently create and maintain their website using any iOS or Android device. 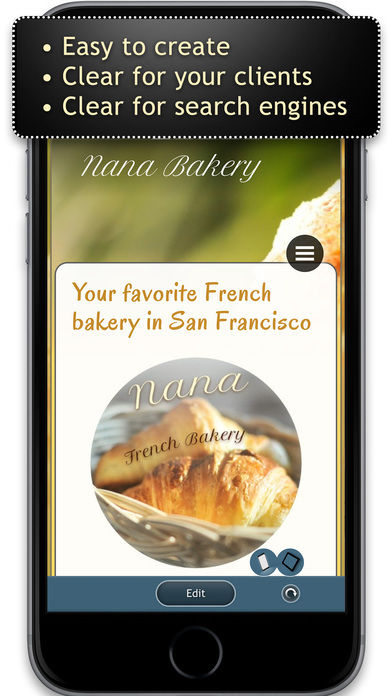 The app incorporates simple techniques and lets you focus on what matters most in creating the website. The SimDif Website Builder professional application is a tool of choice for individuals and organizations that do no require complicated technical knowledge of building websites and leaves you with all the time to create rich and quality content for your audience. Presenting your business or hobbies on the internet is easier than you think. SimDif Website Builder enables individuals and business professionals alike to have complete control over their websites with the additional advantage of using the content of their choice ... Website Builder creates dedicated websites, because there is never a good time to be interrupted by website problems. As an individual or business owner, the last thing you want to worry about is unreliable website. That's why we have introduced the Website Builder. The application is designed to enable you to effortlessly shift between your Android tablet, iOS device and your computer to work on your site. This is the application equally handy for those who just want it for personal use, and those who want advanced functionality. For simple website, it grants easy and free hosting, no advertisements and don't require any code to learn from. This practical Website Builder helps increase productivity by keeping users communicating through built-in tips and guides to assist you to concentrate on the job at hand by writing to your readers and search engines. There is even a 24/7 help support system for those facing any challenges with the application. SimDif Website Builder offers dual features for starter sites which are offered free of charge if published and those for Pro sites. * Includes theme designer - choose from amazing themes to create your own customized website. The features were designed to give clients the necessary head start in creating their content which is not only informative for communication purposes but also has the necessary additional features to ease business transactions. Version 1.92.1 improves security of the contact page, as well as fixes a bug when using the camera on an iPad mini, a login problem for a few users, and link editing. The new version now spreken nu ook Nederlands! Language Support: SimDif Website Builder supports English, Basque, Czech, Dutch, Finnish, French, German, Indonesian, Italian, Japanese, Korean, Norwegian Bokmål, Polish, Portuguese, Russian, Simplified Chinese, Slovak, Spanish, Swedish, Thai, Traditional Chinese and Vietnamese languages. SimDif Website Builder 1.92.1 is Free (with in-app purchases) and available worldwide through the App Store in the Business category. It is also available on Google Play and Amazon. For more information, please contact Yorick Vince. Chiang Mai, Thailand - Simple Different Co., Ltd is a leading supplier of ICT application tools and it's innovations and creativity has seen it taking a leading role in this industry. The company ensures the success of any website creation and maintenance by integrating adequate guidance tools and excellent customer service. The company deals with individuals and professional organisations across a wide range of industries that need productivity, increased efficiency and right communication tools to their clients. All Material and Software (C) Copyright 2017 Simple Different Co., Ltd. All Rights Reserved. Apple, the Apple logo, iPhone, iPod and iPad are registered trademarks of Apple Inc. in the U.S. and/or other countries. Other trademarks and registered trademarks may be the property of their respective owners.